The problem is the inevitable fiber damage due to chemical treatments, heated styling tools and hair age. To stop and reverse this deterioration process, FarmaVita has developed Omniplex, an innovative system to restore the natural hair structure DURING CHEMICAL TREATMENTS!!! 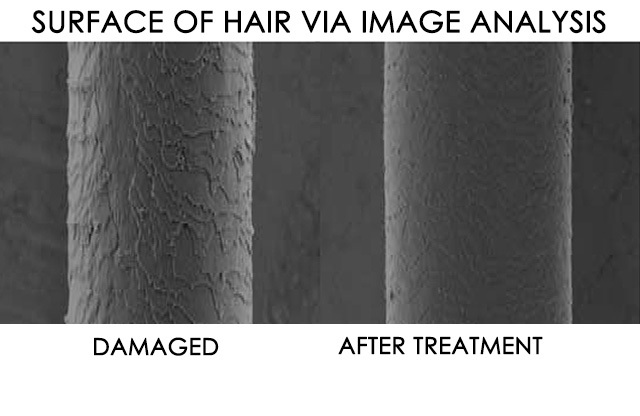 Omniplex is based on a new technology capable of long-lasting repair of the hair fiber, for extraordinary and immediately visible results! Omniplex is free of Sulfate, DEA, Paraben, MI. Omniplex is based on a new and exclusive molecular technology composed of blend of active molecules. The core of this innovative technology is a molecule characterized by Amino groups placed at the edges of the Polymer chain. This peculiarity allows the Polymer chain to assume a “horseshoe” shape and this allows it to bind tightly to the hair. Moreover, the chemical/physical characteristics of the active ingredients selected (no water solubility, high molecular weight, high affinity to hair...), allow the complex to settle on the hair and not be eliminated with the first shampoo. This is why Omniplex is so effective. A rich blend of high performing and innovative actives, act in combination with precious oils (Jojoba and Sweet Almond) and emollients creating a real innovation in professional haircare. - it seals the cuticle. Hair is stronger, shiny and flexible. BOND MAKER was developed by FarmaVita cosmetic research laboratories to be mixed with all chemical services, in particular colour and bleaching. It builds and enforces strong structural bonds, protects hair from breakage and helps prevent hair damage caused by chemical treatment. It doesn’t interfere with the chemical service undertaken, no adjustment to the processing time or application time. BOND REINFORCER is applied after rinsing the chemical process. It contains high performing actives and was developed in a creamy texture for easier application. BOND REINFORCER stabilises the bonds, deeply nourishes, seals the cuticle and protects the colour (for long-lasting colour). It is not a conditioner. MIRACLE AT HOME is a luxurious at home treatment: Miracle at home is a white cream with a velvety texture, it is easily applied thanks to its new brush applicator that allows you distribute the cream evenly. Miracle at home reactivates the rebuilding molecular complex of the professional Omniplex treatment (in salon service), in only 5 minutes. Mix hair colour with the proper amount and volume of peroxide following your usual system and habits. Once the hair colour is properly mixed into the bowl: add 1ml of Omniplex n.1 every 10ml of hair colour cream. For superlighteners (1:2 dilution): add 2ml of Omniplex n.1 every 10ml of hair colour cream. Apply hair colour and leave on as usual, rinse off carefully and shampoo. On damp hair, apply the proper amount of Omniplex n.2, depending on hair length, and leave on for a minimum of 5 minutes. Rinse off carefully and blow dry. Example: hair colour treatment 1:1 with 60ml of hair colour + 60ml of cream developer. Add 6ml of Omniplex n.1. Example: 50ml of superlightener + 100ml of cream developer. Add 10ml of Omniplex n.1. Mix bleaching powder with the correct peroxide, as usual. Once the bleaching powder is properly mixed into the bowl: add 2ml of Omniplex n.1 every 10gr of bleaching powder. Apply the mixture and leave on as usual, rinse off carefully and shampoo. On damp hair apply the proper amount of Omniplex n.2, depending on hair length, and leave on for a minimum of 5 minutes. Rinse off carefully and blow dry. Example: highlift treatment with 20gr of bleaching powder + 40ml of cream developer. Add 4ml of Omniplex n.1. (without chemical treatments) significantly reduces hair breakage, restores the hair’s natural structure and seals the cuticle. Hair is stronger, shiny and flexible. Mix 10ml of Omniplex n.1 with 10ml of Omniplex n.2. After shampoo, apply from roots to ends on damp hair and place under heat source for 5-10 minutes depend on the level of damage of the hair fiber. Rinse off carefully. Proceed with a second application of Omniplex n.2 from roots to ends, comb through and leave on for 2-3 minutes. Rinse off carefully and blow dry. Mix 10ml of Omniplex n.1 every 50ml of straightening cream. Apply as usual and rinse off carefully. Apply the necessary amount of neutralizer. Leave on and then rinse off carefully. Evenly apply the proper amount of Omniplex n.2, depending on hair length, and leave on for a minimum of 5 minutes. Follow a regular perm application process and rinse off carefully. Apply the neutralizer and leave on for the necessary time, remove rods and towel dry well. For medium to long hair apply evenly 30ml of Omniplex n.1 from roots to ends and leave on for 10 minutes. Apply Omniplex n.2 without rinsing, from roots to ends and leave on for 5 minutes.